Engaging children with Nantucket’s natural resources through school field trips. Cultivating an appreciation of nature at an early age ensures the legacy of an environmentally-minded community in the future. The education program is led by Resource Ecologist Emily Molden with support from area teachers from schools K-12. This school year brought Ms. Molden to a variety of classrooms in Nantucket Elementary, Middle and High School as well as the Nantucket New School and Nantucket Lighthouse School. Educational presentations focused on Nantucket’s natural habitats with an emphasis on plant and insect species native to the island. A fall field trip with first-graders explores the seasonality of these creatures and habitats. Another engaging experience demystified our island’s sole source aquifer and highlighted local watersheds. Students observed relevant concepts and features in the field, after engaging with the water quality model in the classroom. 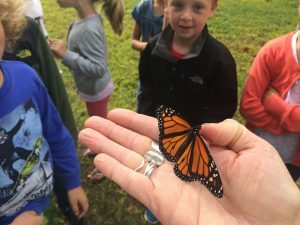 The ever popular Monarch Life Cycle program rounds out our fall offerings. Ms. Molden provides monarch larvae to several classrooms with some milkweed for habitat and food. Students watch as larvae slowly turned to butterflies before releasing them into nature. In addition to classroom visits, Ms. Molden participates in after-school and enrichment offerings for island students in partnership with the Maria Mitchell Association and Nantucket Community School. The Maria Mitchell Science Festival, held in the Spring, is also an opportunity for us to share our love for Nantucket’s water resources with Nantucket children of all ages.